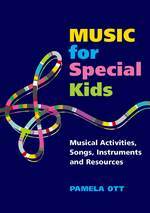 Just got word that my book entitled "Music for Special Kids - Musical Activities, Songs, Instruments and Resources" is going to print today at Jessica Kingsley Publishing! Packed with inspiring tips, activities and song ideas, this practical resource will have everybody singing, clapping and playing along! 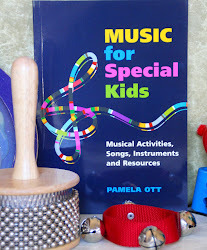 It explains simple and fun ways of using songs, instruments and musical games to connect with children of all levels of ability, and includes helpful rhythm worksheets and sheet music. There is a wide range of suggestions for songs and activities that encourage communication, increase self-esteem, stimulate fine and gross motor skills and motor coordination, and promote relaxation. I'll be sure to let you know as soon as it's available! In my neck of the woods, we are still smack dab in the middle of winter and are probably looking at at least a month more of it, but in eager anticipation of an eventual change of weather, I am posting an easy circle time weather song. This one has been in my grab bag of songs for a very long time and I'm not sure where I originally got it. I changed some words to fit my situation and I hopefully you will too! Is it cold or is it warm? It is sunny here today. 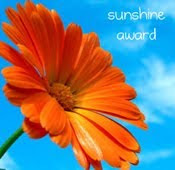 It is sunny here today! Here's an easy Valentines Day song to teach to your kiddos this coming Monday. It's called H-E-A-R-T and it's sung to the tune of BINGO. Happy Valentines Day! And heart is it's name-o. And heart is it's name-o! You can sing and play this song the same way as BINGO. Leave out one more letter on each repeat and use a clap in place of the letter. If that is difficult for your child, you might want to write the letters on a white board, crossing off one letter each verse. Practice clapping once fo each letter crossed off before singing the next verse!